Did you know that Americans spend an average of 4+ hours on their cell phones every day? Eighty-percent of that mobile device time is spent in mobile Apps, according to app analytics firm Flurry. Now CVUSD can be one of your favorite App destinations - with the launch of the new, "Conejo Valley Unified School District" App. Step 3: Select “Get” and then “Install” to download the Conejo Valley Unified School District app to your phone. Step 4: Open the Conejo Valley Unified School District app. Step 5: You will be greeted by a “Welcome” screen that states, “To get started, select schools you’re interested in.” You can then search or type in the name of the school(s) you’d like to follow. Step 6: Should you accidentally exit this menu before selecting your school(s) or decide you’d like to follow additional schools this can be accomplished by visiting the “Settings” icon within the App. Once in the “Settings” menu, select the “Follow schools” option to view a list of all Conejo Valley Unified School District schools. Student Info: This is where parents and students can log in with their “Zangle/ Q Parent Connect” username and password to access their “Q” accounts. Once logged in parents and students will be able to view class schedules, grades, absences and other student specific information. Parents will be able to see this information for all of their children enrolled in CVUSD. Directory: This is where App users can find the contact information for all staff and teachers at each school site and at the district office, including school board members. Notifications: This is where “All Call” messages will live. When users first download the “App” it will ask if they want to receive “push notifications” – please select “yes.” This will allow for a pop-up to appear on App users phones whenever a school they follow sends out an “All Call” message. Resources: This is where App users can view the “Resources” from the district. Personalize this section of the App to instead show the “Resources” of the school of your choice, by opening up the “Resources” icon and then selecting “Change” in the top right corner. You will then find a list of all the schools – select the school of your choice. Calendar: This is where App users can view the district calendar. Personalize this section of the App to instead show the calendar of the school of your choice, by opening up the “Calendar” icon and then selecting “Change” in the top right corner. You will then find a list of all the schools. Select the school’s calendar you would like to view. Your Hub: This is where App users can, in one singular place, scroll through the “feeds” for all of the schools they follow. 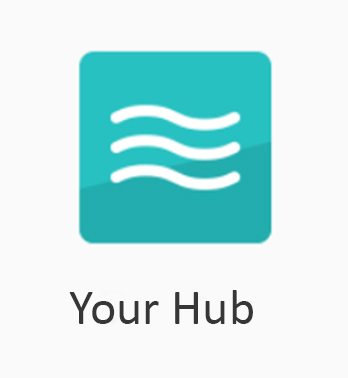 “Your Hub” pulls all of the Facebook and Twitter feeds from the schools that the App users follow. Facebook: This is where App users can view the Facebook posts from the district. Personalize this section of the App to instead show the Facebook page of the school of your choice, by opening up the “Facebook” icon and then selecting “Change” in the top right corner. You will then find a list of all the schools who have Facebook pages – select the school of your choice. Twitter: This is where App users can view the Twitter posts from the district. Personalize this section of the App to instead show the Twitter page of the school of your choice, by opening up the “Twitter” icon and then selecting “Change” in the top right corner. You will then find a list of all the schools who have Twitter pages – select the school of your choice. Settings: This is where App users can select schools to follow, select a different language for the app, configure alerts and easily share the app with friends and much more.